Not every garden has to be large to enjoy its beauty. 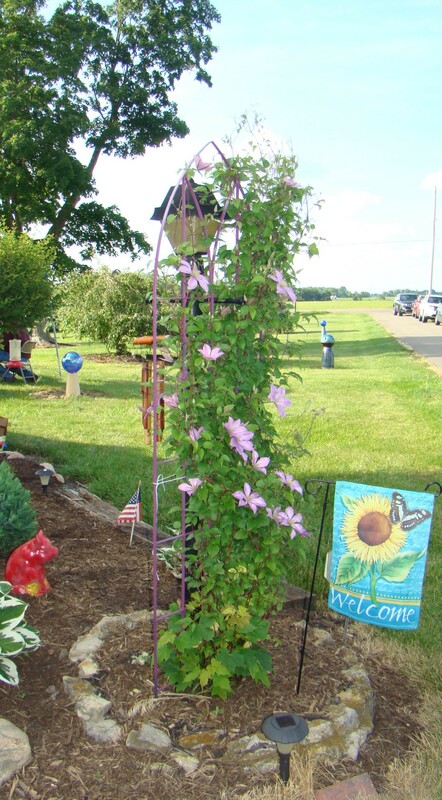 In a southwestern corner of Ohio, this friend’s garden bloomed vigorously during a recent visit. An old friend, Bess Siegfried, had moved from Cambridge to the Dayton area on a farm owned by Jill Kesler. The open fields there provide great viewing of sunrise, sunset, and the evening stars. Bess enjoys sitting on the porch enjoying nature – and her flowers of course. Ever since she was a young girl, Bess found her life surrounded with flowers. Both of her grandmothers were gardeners – vegetables and flowers. One grandmother planted flowers around the edge of her garden to ward off unwanted snackers. But whenever Bess visited them, she helped and learned about gardening. Once in her teens, she chose flower gardening as her main passion and has continued that ever since no matter where she has lived. Inside and out, plants are evident and cared for with a special touch. Part of her success, it seems, comes from the fact that Bess is also an excellent artist so has an eye for making things look beautiful. Sunflower stepping stones invite exploration. 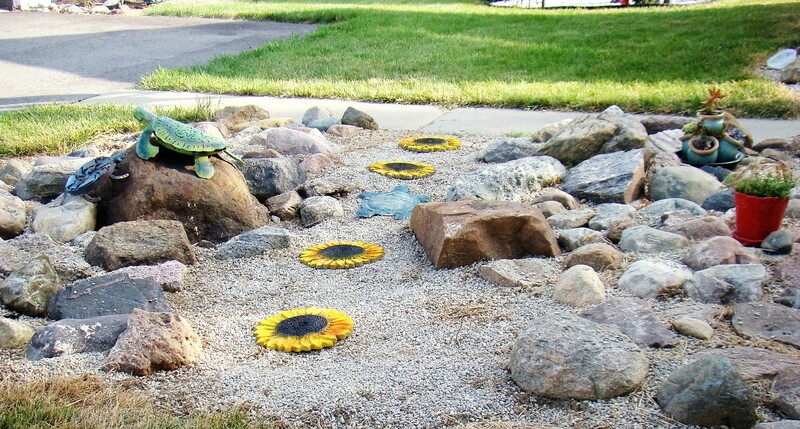 An interesting rock garden with freshly painted sunflower stepping stones was created over the years through the help of Jill’s father, who found these rocks as he plowed the fields on their farm. Her favorite turtle figures appear to add a little character to the garden. 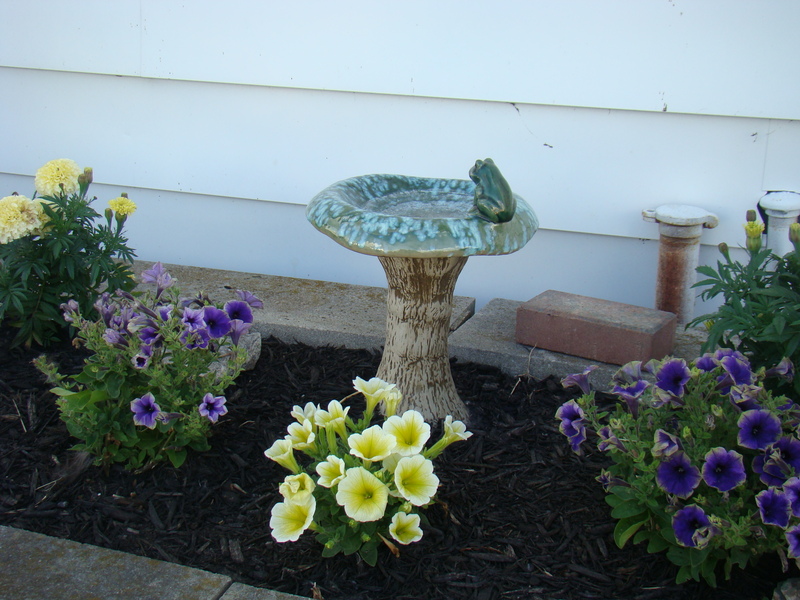 Beautiful flowers surround this bird bath. This summer was one of early heavy rain so plants got a great start. Then things turned dry, and Bess had her hands full watering all the flowers. Even though the flowers slowed down their blooming, the weeds kept growing fine. Her advice: Be very disciplined in the care of your flower garden, if you want it to be a success. A Chinese Garden captures the eye. Originally, this area had just the one tall schrub, which seemed to have a Chinese flavor. 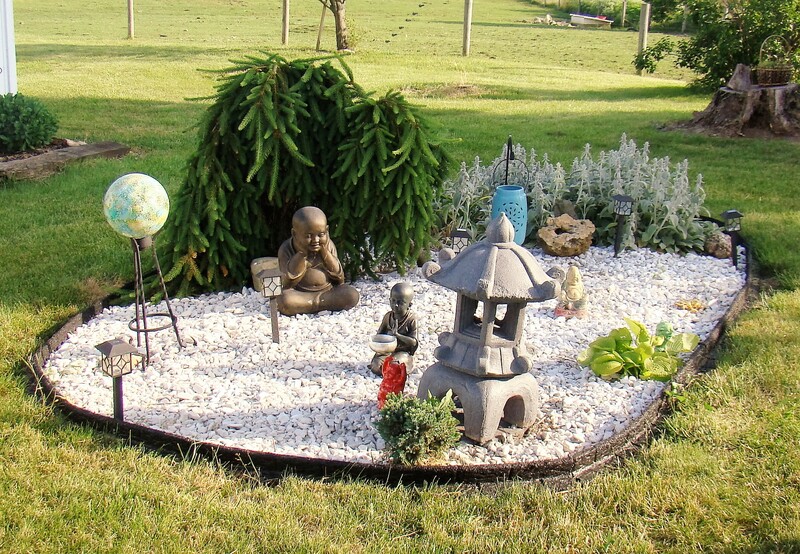 So Bess decided to get some white gravel and then added some Chinese Buddhas, Oriental figures and a small pagoda along with a few small plants. The storage shed highlights various native American creations. 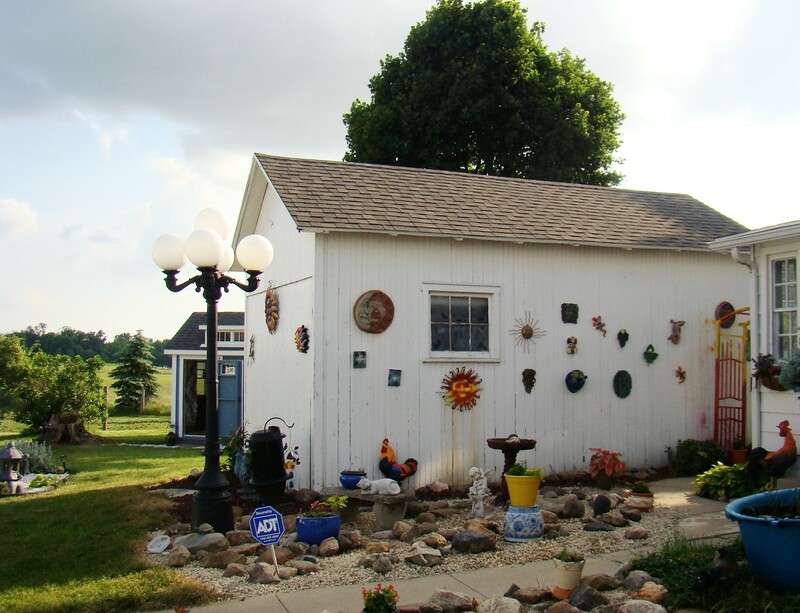 This collection of Sun and Moon faces on the side of a storage shed were found by Jill in her travels – some from Zanesville Pottery. Their circular shape symbolizes the never ending circle of life. Another rock garden grows here as new pieces are spotted along the way…with flowers and plants added by Bess. A modern “she-shed” provides a perfect escape. Males have always escaped to their “man caves”, while women usually headed to the kitchen. Today the female population has come up with a new idea…a “she-shed”. Here they can relax from the cares of the home and the world, in a comfy chair surrounded by treasures that make them happy. No television sets or phones allowed, just a good book or a craft project permitted. 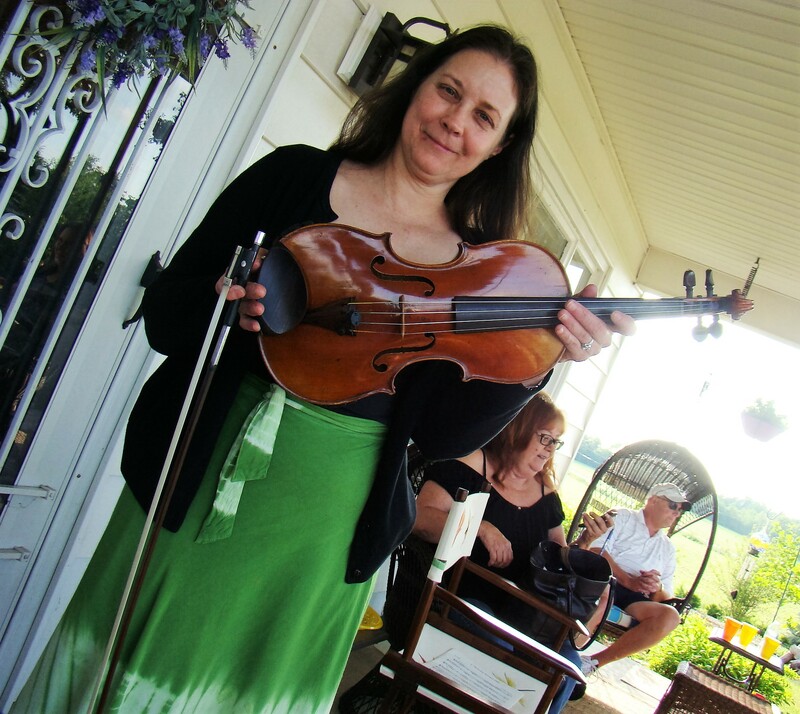 Barbie Garrett, violinist for Springfield Symphony Orchestra, provided entertainment. Barbie’s violin held special memories as it belonged to a friend of the family, Jill’s father, a music teacher and violinist. Even though she had a violin of her own, she never used it again after this precious, old treasure came into her possession. Her music was a real pleasure to end an enjoyable afternoon. “Bloom where you are planted” applies to flowers and people. Finding a blossom in an unexpected place always brings a smile to my face. Finding a talented person in an unexpected place brings a smile to my face and joy to my heart. May you bloom wherever you happen to be in your life. Flower gardens are one of my favorite places as you can tell. I love the unexpected surprises in the small places around the property. The She-Shed is charming and the best surprise of al!! 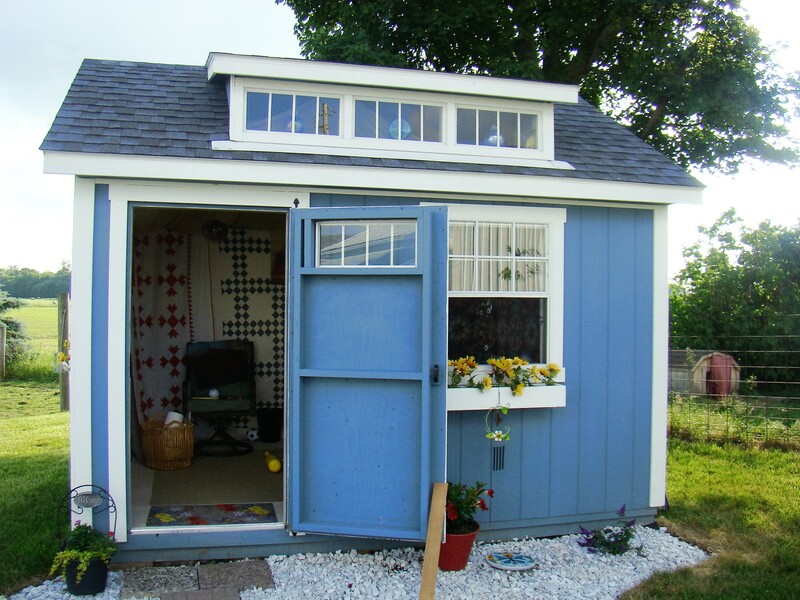 Every woman should have a She-Shed for a handy escape. I was actually trying to locate Bess Siegfried online when I came across your blog. Bess was one of my mother’s (Barbara Penn Switzer) best childhood friends. If you would be able to get me in touch with her, I’d truly appreciate it! Thank you so much! I will email you contact information. Watch for an email from Gypsy Bev soon. We went to high school together and have been friends for a long time.